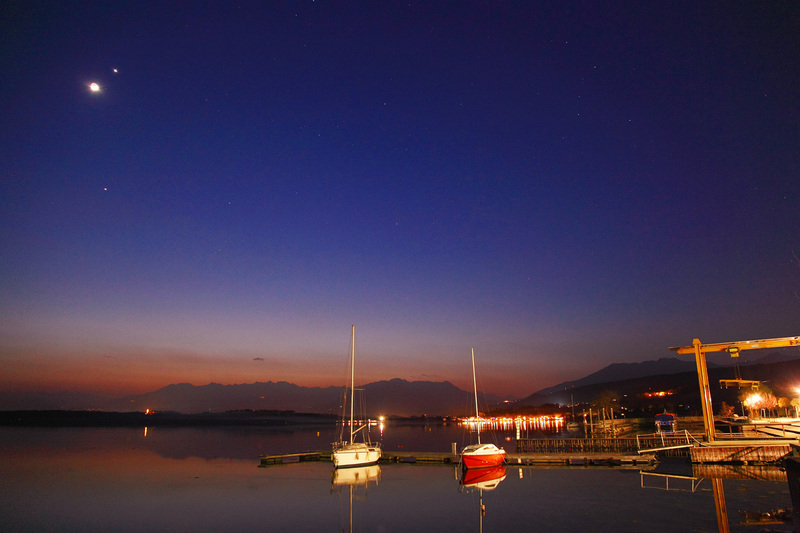 Please find below an image I took from Turin (Italy) on March 25, 2012 and showing my children contemplating the splendid conjunction between the crescent Moon, Jupiter and Venus. 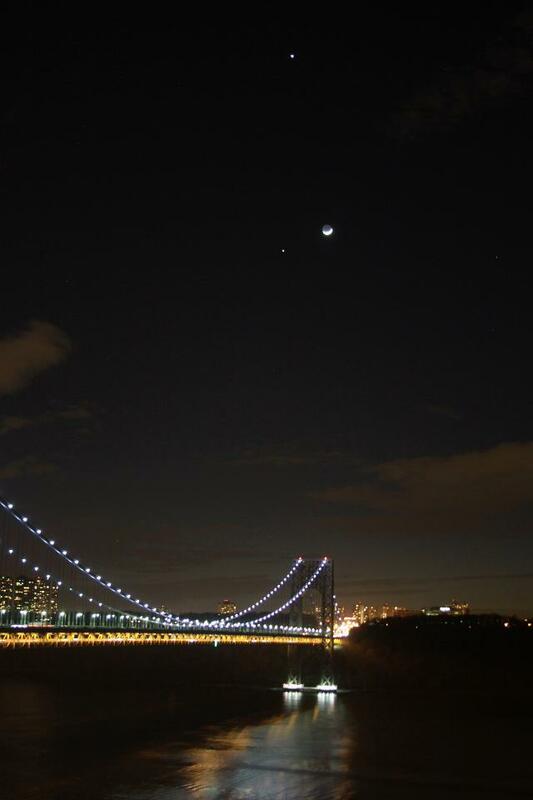 Venus, Jupiter, Moon, George Washington Bridge. Last edited by Rothkko on Tue Mar 27, 2012 7:17 am, edited 3 times in total. A nice weather toonight in Paris. 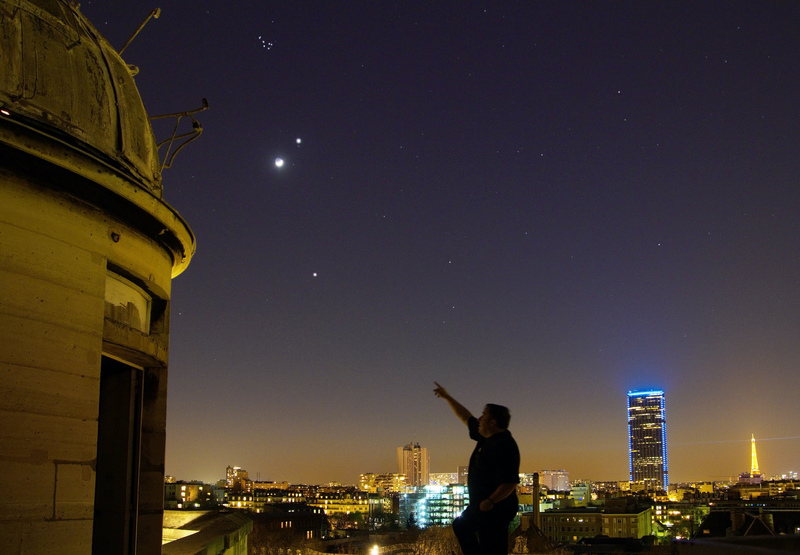 The astronomer François Colas show us the close encounter between the Moon and Venus, from the roof of the Paris Observatory. This old building was built under the reign of Louis XIV, nearly 350 years ago. At this time the observatory was out of Paris in the country. But the city became biger and biger, and finaly absorbed it. Last edited by owlice on Tue Mar 27, 2012 11:54 am, edited 1 time in total. 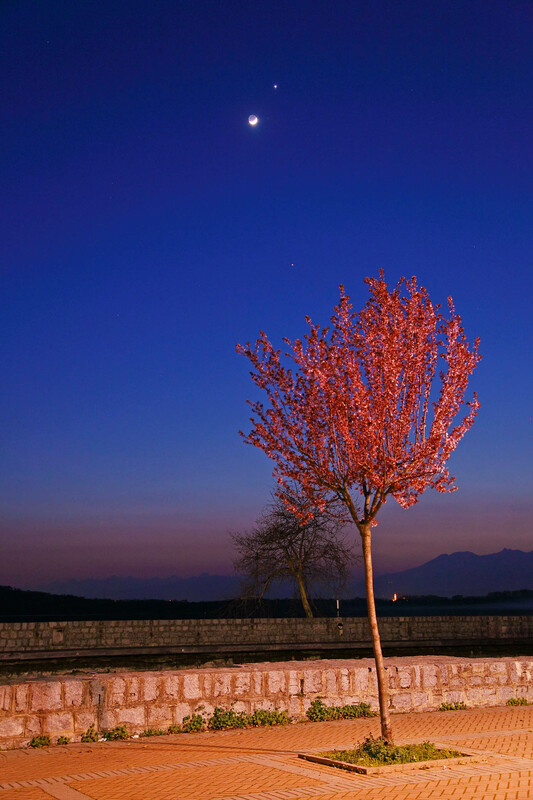 Please find below two images of the conjunction I took on March 26, 2012 from the banks of the Viverone Lake (few km from Turin, Italy) where signs of spring were all around with trees full of blossoms. Collected just after sunset on March 26, from central Colorado. 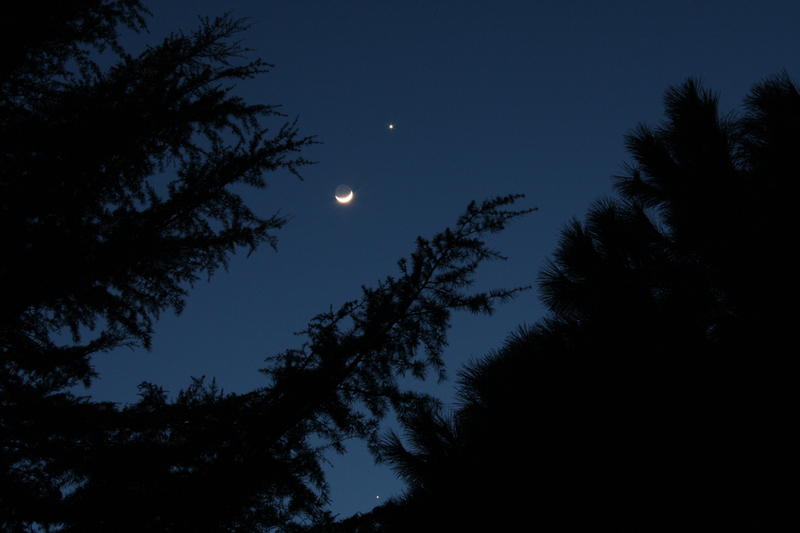 Captured from our driveway, looking toward the western sky, is this rendezvous between the Moon, Venus, and Jupiter at 6:54pm CDST on March 26, 2012. The 3.93 day old waxing crescent Moon was just a little over 2 degrees seperated from Venus with Jupiter about 12 degrees below the Moon. A couple more for the M-J-V conjunction collection . . taken on successive evenings in North Yorkshire, UK. as viewed from different parts of the world . . . to everyone! 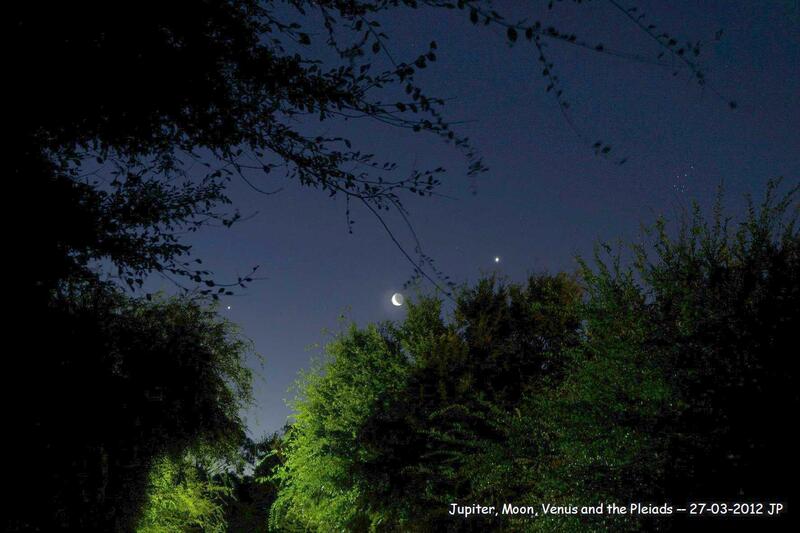 A nice view of the Moon, Venus, and Jupiter from my pool deck in Miami, Florida. Immagine della congiunzione tra Venere Luna e Giove, fotografata dalla Sicilia il 260.03.2012 con Canon 1000D e Canon 18/55, posa di 4". Last edited by owlice on Wed Mar 28, 2012 6:33 pm, edited 1 time in total. Reason: Attached smaller image; left link to larger image. Thanks for sharing! 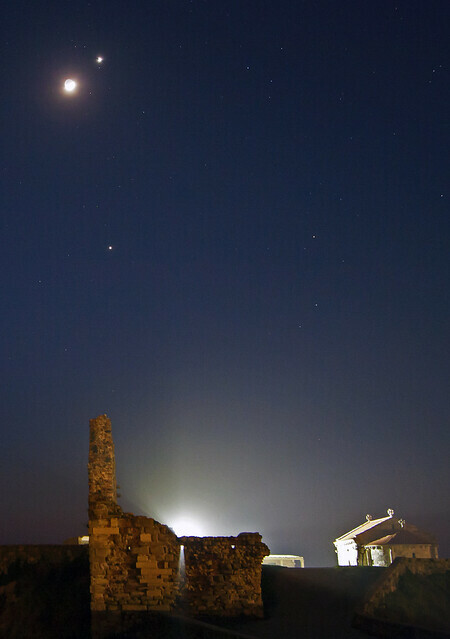 This image shows the crescent Moon passing the planet Venus, and was taken somewhat later on the same evening. 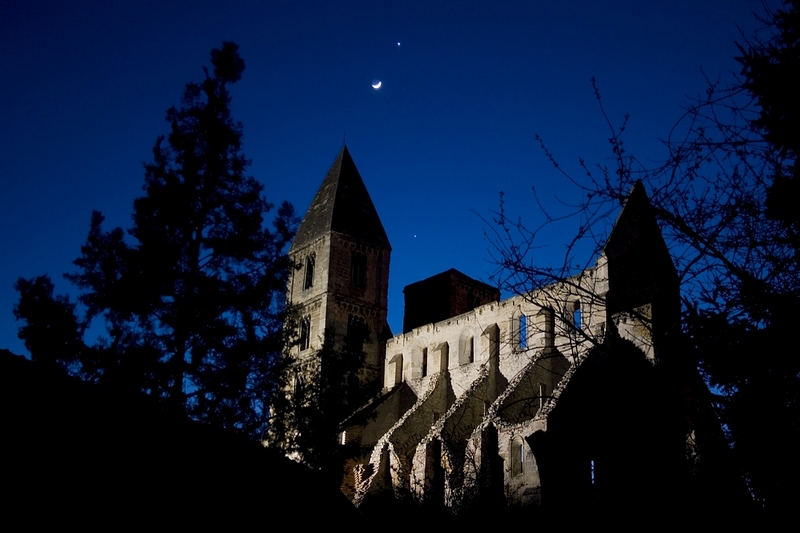 The moon's dark side is illuminated by Earthshine. Light from Venus is diffracted by a thin cloud layer, forming an atmospheric Corona around the planet. Last edited by herbraab on Thu Mar 29, 2012 8:17 am, edited 2 times in total. 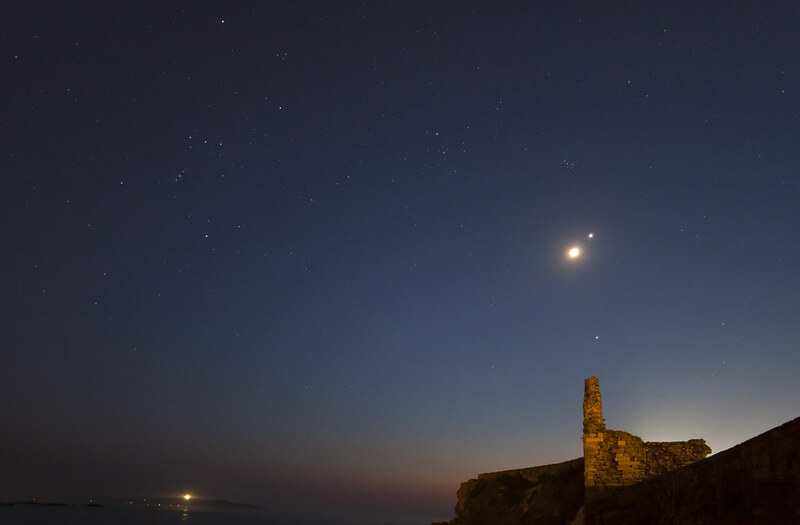 Over the ruins of the Lanzada's tower, built in the twelfth century as part of a coastal defense system against invasions by the Normans, and demolished in the fifteenth century during the Irmandiños riots. Beside him is the Romanesque Chapel of Our Lady of a Lanzada of the late of the twelfth century, erected on an ancient sanctuary dating from the beginning of our era and famous in the NW corner of Spain for its fertility rites ( the bath of the nine waves). Last edited by Rothkko on Sat Mar 31, 2012 10:37 pm, edited 2 times in total. On Sunday evening, March 25, 2012, the crescent moon is next to Jupiter at the base of the narrow triangle with Venus at the upper apex. 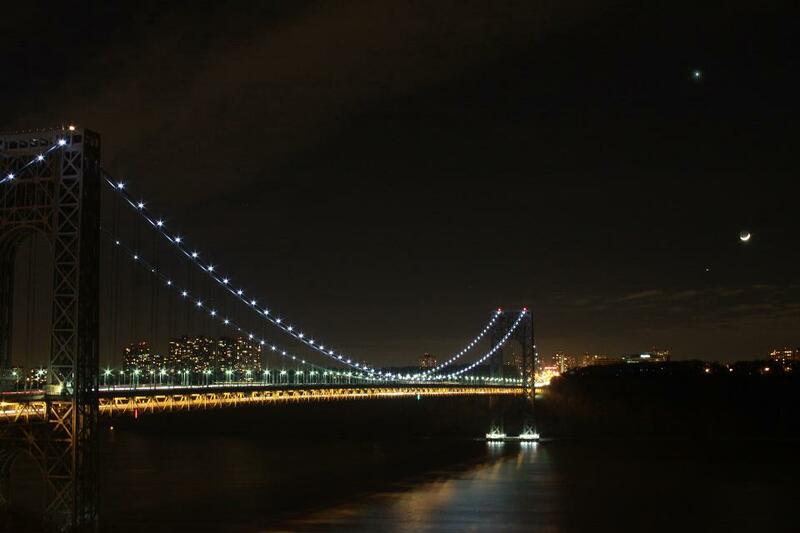 Taken at 8:09 pm EDT from Maple Shade, NJ, USA, with a Canon 40D digital SLR camera (on a fixed tripod) and a Sigma 18-50 mm f/2.8 zoom lens at 18 mm focal length. Exposed 1 second at f/3.5, ISO 400.